Custom Aluminum Signs give more resilient and industrial yet simple look. Aluminum sheet stays tough in the weathering changes and is the preferable rustproof exterior sign material for many decades. Many Aluminum signs have mass usage also indoors as a logo sign or a name plaque and so on. 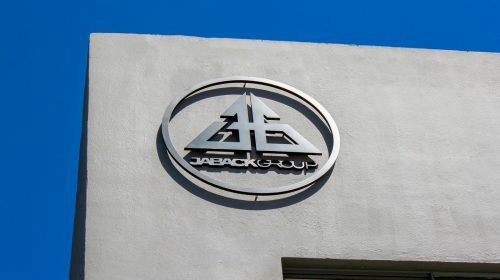 Front Signs found many creative solutions and uses of Metal signage to your advantage. 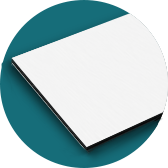 We offer silver, gold, white and black Aluminum panel sheets with matte, reflective, brushed, glossy or mill finishes. The printing can be done either on one side or two sides of the sigh, depending on your needs and requirements. Due to its durability and solid look Aluminum signs are still in high demand for its untouchable qualities. It’s the most long lasting sign you can ever buy for your business. 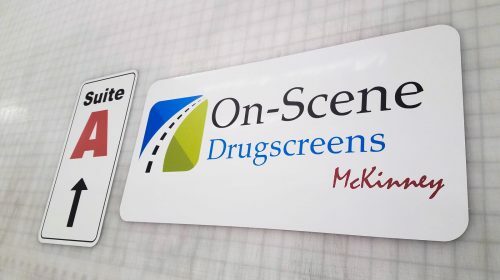 These signs are a popular solution for parking lot signs, Office logo signs, and name plaques. It is preferred type of material to use as a warning or prohibition signs, security sign, etc. Aluminum custom cut signs can have single or double sided print with resistant UV inks. Among the benefits of personalized fast manufactured Aluminum sign is its durability and longevity. Aluminum Signs are a popular choice because of their low density and corrosion resistance. Due to its solid surface and specific color Aluminum metal is all-time favorite for office signage, Office signs, Directional Signs, etc. Medical institutions like hospitals or dental clinics highly benefit from this material and found multiple usage possibilities and diverse purposes to fit in. Aluminum metal signs can be fabricated to fit your needs and requirements, Aluminum letters, Logo signs, reception decorative signs and alike are very popular choices for business establishments. Aluminum signs are also used for corporate and architectural signage. Aluminum signage have more professional and expensive look. Moreover, combined with Vinyl lettering or printing, Aluminum business sign gives great results and adds more color to the white or monotonous looking walls. 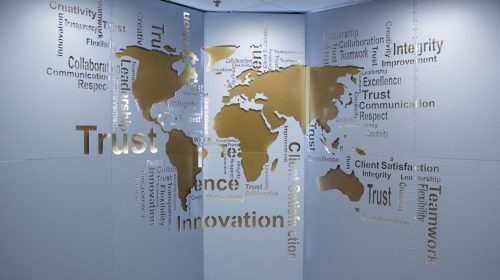 The Combination of Aluminum and Acrylic decorates many office interiors as a logo sign, directional sign and what not! Further areas of usage are construction and extreme climate areas. Custom metal signs are easy to handle and install. Depending on the size and the difficult construction, it can be hanged, framed, glued onto the other surface or posted.It’s simple to drill through and attach to the bolts if necessary. Besides, they can be mounted on the concrete with screws for extra safety. Also, one can use zip ties to fix it to any base leaving no wiggles. Here at Front Signs we offer installation services alongside with the manufacturing and 3D modeling. Our professionals are ready to for any tough or large-scale sign installation, so when in need do not hesitate to contact us! 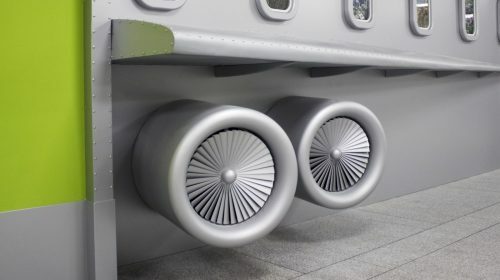 For storage under an extended period, aluminum should be stored vertically to provide enough air circulation over the entire surface. 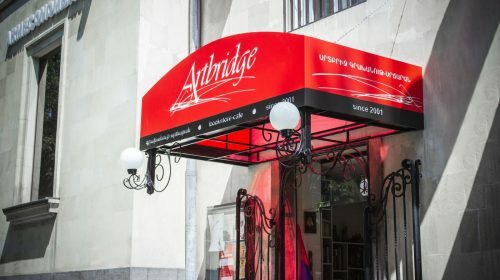 The metal sign should be kept indoors in a clean, dry and dust free environment without any contact with other materials. Avoid interference with sharp surfaces and scratches. The cleaning can be done with plain water and a dump cloth. After cleaning the aluminum sheet should be completely dried. Dibond – if you are looking for a lighter but equally durable material, Dibond is the perfect material to suit your requirements. 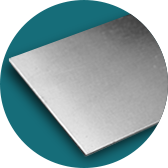 It is composed of two thin Aluminum sheets that are sandwiched between polyethylene core. Compared to same size 3mm Aluminum, 3mm Dibond is lighter, thus is sometimes preferable for outdoor and indoor usage. PVC signs – for a decent alternative among plastics, PVC signs stand out among non-aluminum materials. PVC signs are much lighter, comparatively less expensive and serve their purpose for 5 years with proper care and placement. Acrylic signs – highly used as an office signage, Acrylic signs meet even the trickiest requirements. With the variety in color, shapes, transparency and workability Acrylic Signs come great alternatives to Aluminum signage. Wooden signs – Most of the time used as an interior logo sign or decorative artwork, wooden signs are the newest trend many businesses like to refer to instead of Aluminum. 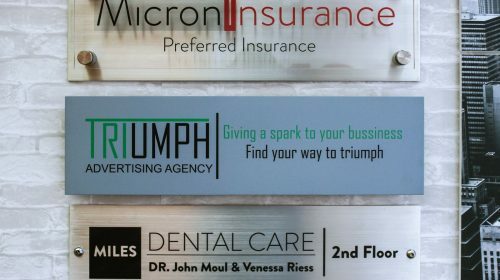 Brushed Aluminum Signs elevate the interior and exterior premises to set a modern and sleek tone. 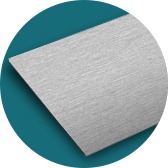 The brushed metal effect has a silver metallic color, creates a unique vibrancy, has long durability as it comes already laminated, thus also scratch resistant. Moreover, it is also weather resistant, rust-proof and waterproof – perfect for mid-term and long-term outdoor usage. This elegant, wall-mounted sign can be displayed in any business establishment or any other prominent location to give a presentable and solid look. More often, can be seen as a lobby, hallway decoration or a directional-wayfinding sign. For office interior layout, it’s highly used as a branding tool and department wayfinding accessory. Brushed metal signs – a stylish alternative to plastic signs, compliant with your property and match interior design. 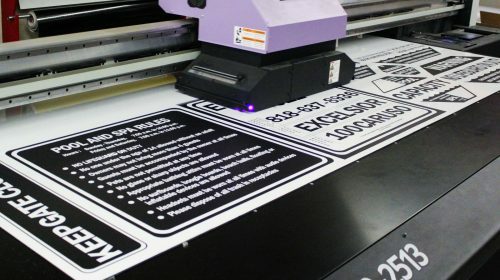 The digital printing capacities enable us to manufacture full-color logos, messaging or design elements and take the signage solution above anything done. Even though the sign is only one-sided, as it is usually mounted onto the wall. The graphics are guaranteed to serve a lifetime as it’s a high-gauge Aluminum sheet printed with state-of-the-art, UV inks with lasting-print durability. Furthermore, the metal sign is cut to any shape and size, the light-weighted material thus can be used virtually anywhere. If durability and flexibility is what you seek for your ad campaign or interior branding, then Brushed Aluminum signs are an excellent choice. It is sure to catch the attention of your customers and make it your ultimate favorite choice. Let us know if you are working on a project, so we can get started on brainstorming on your project! Brushed Aluminum has a beautiful appearance and a fashionable surface, ready to make a strong visual impact. Brushed Aluminum signage is used as a photo frame, Door plaque, Window sign, decorative or directional board. Its has a mass and versatile usage both as an interior and exterior display. 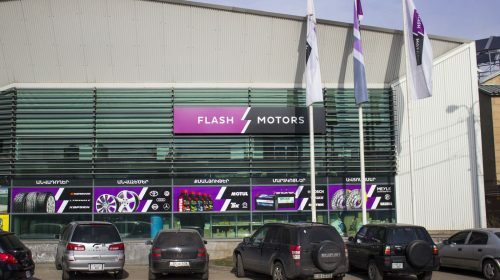 Due to its rustproof feature, it is the preferable choice for Commercial architecture: Building number plates, exterior letterings, ID tags, etc. 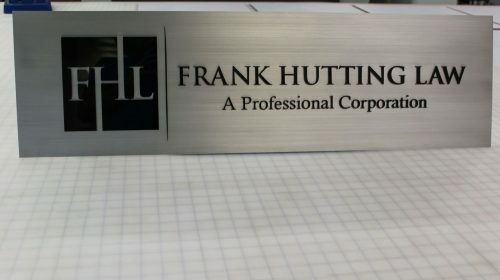 Apart from the business applications, the Brushed Aluminum signs are also used as a household decorative furniture. For example, Brushed metal is used as a photo frame, gift, etc. Moreover, people use it as a house nameplate, directional sign, etc. Thickness: 0.032", 0.040", 0.060", 0.080", 0.090", 0.125", 0.25"
Custom Brushed signs, depending on the size and construction difficulty can usually be mounted directly, glued, fixed with Standoffs onto wall or any solid surface, ground mounted or hanged. The signage project can be manufactured in any typeface, fixed onto a wall with screws, standoffs or adhesive tape. The standoffs especially create a dimensional sign – note that the brushed sign will stand minimum of 10mm from the wall. Usually, it the sign has moderate size, you can handle the installation on your own. We highly recommend trust our appointed specialists, who will fix the sign the best way for optimal results and time-saving manner. Check our installation services to learn more. 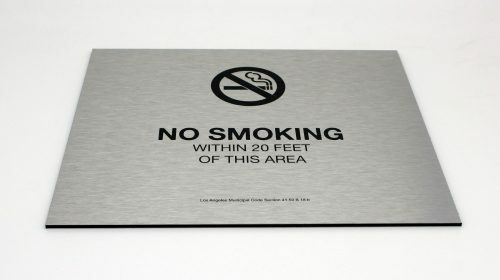 Usually Brushed Aluminum signs have one sided prints as they are fixed onto the wall with standoffs, command strips, etc. We offer Custom Brushed Aluminum signs, which means you can order any sign with your custom requirements. Thus, your brushed metal sign can have double or one sided prints. Aluminum standard mill material looks like a vibrant – full color printed – brilliant artwork with a deep matte and semi-glossy finish. In case of Brushed aluminum, the clear parts of the sign have artsy Brushed Aluminum background. Both have a metallic look and highly solid touch of professional branding. 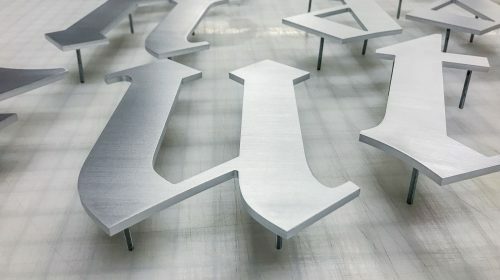 We offer Mill, Brushed, Glossy, Matte finishes for Aluminum signs. All three serve different purposes. 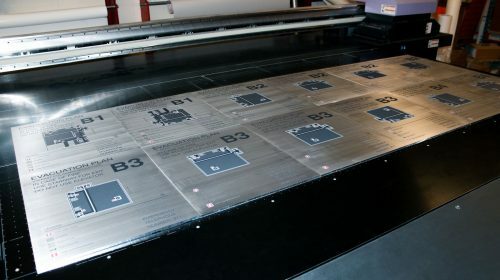 Read the specifications of each of the signs and areas of applications at our blog post Standard VS Brushed VS Reflective Aluminum and choose the one based on your establishment layout and brand style. Aluminum is strong, extremely naturally resistant to rot and corrosion metal. Compared to other metals, it is lightweight and makes the perfect choice for any indoor or outdoor branding signage. This a resilient material which looks great after years, comes with smooth polished finish and great print quality.